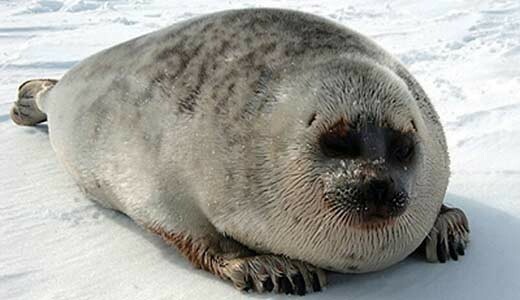 The ringed seal is the smallest of all living seal species. It lives on the Arctic sea ice and ocean. Climate change is the most important threat to ringed seals but frequent hunting by native Arctic peoples, pollution and entanglement in fishing nets are additional causes of population decline. The ringed seal is the smallest of all living seal species and is named after the ring-shaped markings on its coat. They may be small but they are not delicate – ringed seals have a thick layer of fat called blubber, which helps to keep them warm and buoyant and serves as a nutrient source during lean times. Ringed seals have special sharp claws on their foreflippers which they use to cut breathing holes into the sea ice. This is where their main predator, the polar bear, often lies in wait for them. The seals have learned to blow bubbles up their breathing holes to check for bears before surfacing. Female ringed seals create lairs for their pups in the sea ice surface, which provide protection from extreme weather and predators. The pups learn to dive at a very young age and move between interconnected lairs to avoid detection by polar bears. Ringed seals are opportunistic predators that feed on a wide variety of fish and crustaceans. Seals are frequently hunted for subsistence by native Arctic peoples. Pollution and entanglement in fishing nets are additional causes of population decline. Climate change is the most important threat to ringed seals, as it jeopardizes the sea ice habitat they rely on for survival. Additionally, as the sea ice melts, previously inaccessible areas will open to human disturbance such as shipping and oil exploration.